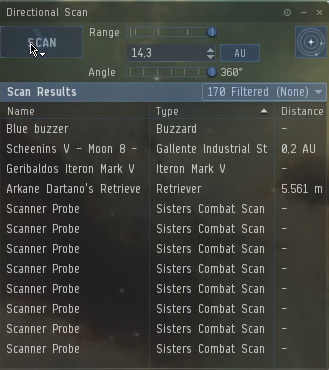 In Highsec, there has been various Codes dealing with specific groups. There is one exception: the Neo-Code. With an emphasis on Anti-Ganking, it seeks to educate both gankers and miners. It's a new vision of Highsec, a fresh breeze with one main goal: a better Highsec. Superstar and ganker Damien Oxytocin has recently joined the "dark" side. He's not only proud of slightly out-dated publications, but he also seems to have a hidden talent in numbers. What's more, he lacks an N-Code compliant Catalyst fit and a Ganking permit. 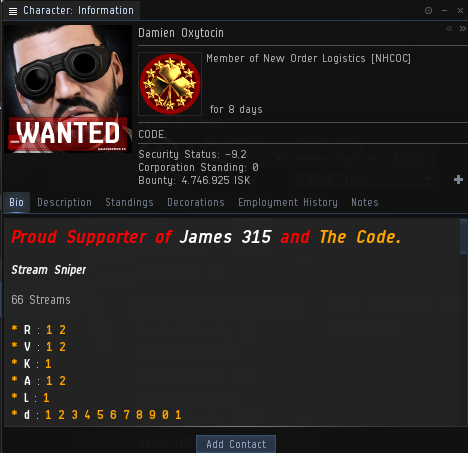 Having renamed my Falcon to All Jams for Damien, I started following his scout from system to system in Minmatar space. I was too late for saving a Retriever that got ganked by Damien. 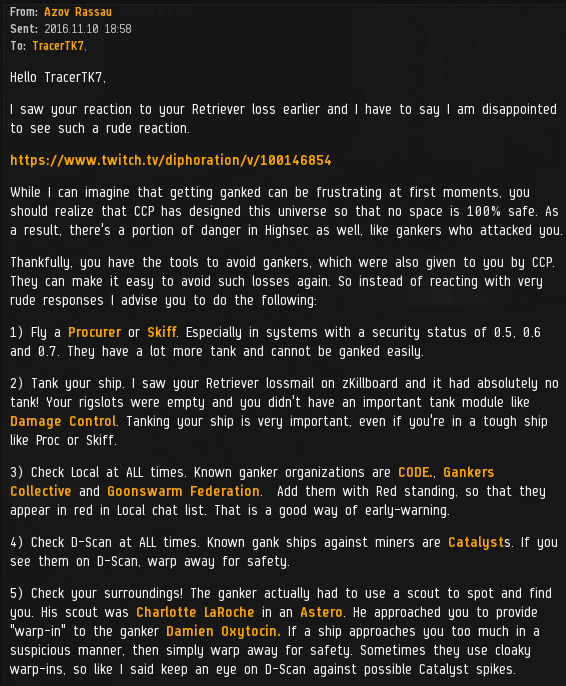 The Retriever's pilot was TracerTK7 and when I saw the following conversation, I was actually quite glad that I hadn't saved him. 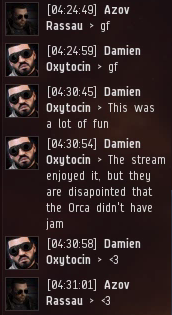 Since Damien was live streaming his ganking operation, the viewers could see this horrible reaction of the Retriever pilot. This is the type of miner that I and our Code seeks to educate and change. In the following hour, I kept following Damien's scout as closely as I can. Eventually, two Hulks were found in another Minmatar system named Hjorafold, a.k.a the introduction to how to pronounce Eyjafjnallajokull 2016. Damien's stream was not showing the scout's screen, so I had to find these Hulks as soon as possible, before he brings the Catalysts on them. 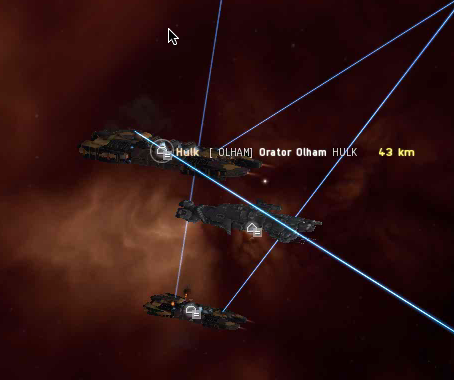 Unlike the angry, AFK, rude Retriever pilot seen earlier, these two Hulk pilots understood EVE: they had brought guns and friends. 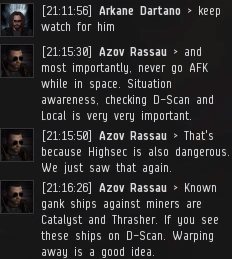 A Tengu and a Proteus were escorting the mining fleet: a cool example of Anti-ganking gameplay and exactly the type of scenery that I want to see more in Highsec. What was missing though, is a ship that could stop the Catalysts' DPS immediately, so I had to get there quickly. Before Damien's arrival, I managed to position my Falcon nearby. Damien brought two Catalysts: himself and "Pony Princess". As soon as the notorious Catalysts landed, roughly 20 seconds before CONCORD's arrival, our Falcon made short work of their targeting system. Activated by the Falcon's electronics officers Sevastus Eruka, Trotinette 'Mawles' Discoman and Jamlord Jammington, the magnetometric projection delivered the punishment to the heretics. 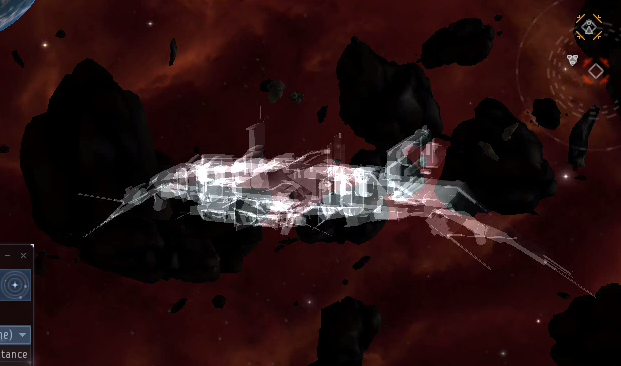 Meanwhile, the Proteus was also striking at Damien's Catalyst with teh guns en masse. 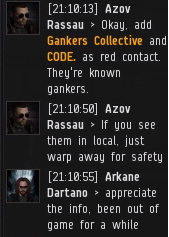 A sudden encounter emerged between the gankers and anti-gankers. 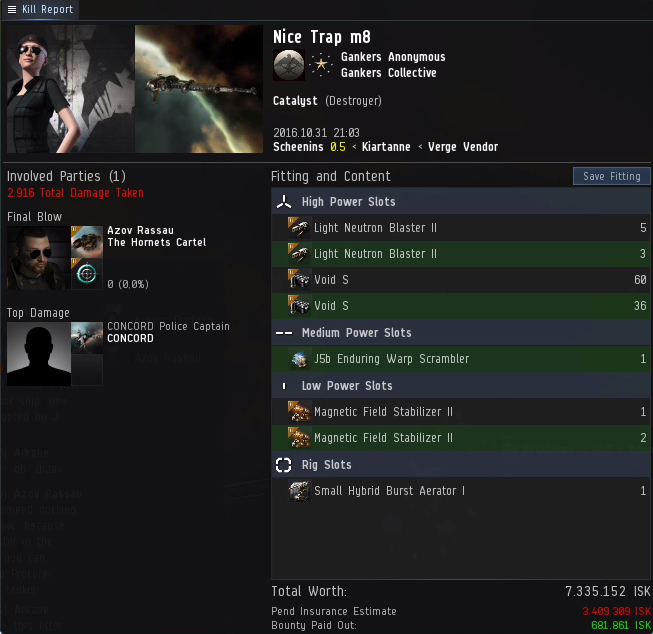 For 20 seconds (CONCORD's absence), Highsec became great again! During this short time, there was a unique, beautiful mixture of different sounds: busy strip miners, ECM waves, reverb of neutron blasters. Pure player interaction. 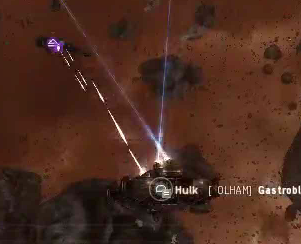 The gank was stopped and prevented successfully, the Hulk was saved. As you can see, CONCORD ruined the fun yet again. 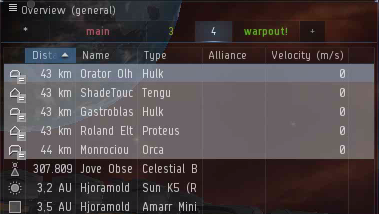 We real players had DPS & ECM. Who needs these stupid invincible NPC police monstrosity when we are there? I think it's safe to say that CONCORD was buffed too much over the course of years. Hell, even the slightest real player reaction is more enjoyable than a God-like NPC police reaction, especially in a player-driven universe like New Eden. 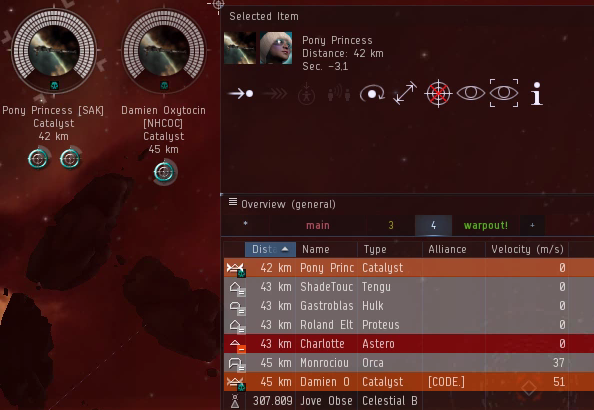 By the way, the excellent fit of "Pony Princess" is already competing for the title of Best Catalyst Fit of the Year. Once again, the sudden fresh breeze of emergent Anti-ganking content brought smiles and fun for everybody in local. GFs and hearts echoed throughout the system. For years, some gankers have mistakenly (or purposely) accused us of being "ineffective", "toxic", "haters" "anti-fun" and "anti-content". Obviously, they confused us with angry miners like TracerTK7 or random butthurt carebears who sometimes talk trash and spew hatred in the Anti-ganking channel. (Such people rarely show up in that channel these days since the moderators have done a good job of muting and even banning those people). Thanks to the exciting content created by both myself and Damien, the stream was illustrating a fun, dynamic EVE. 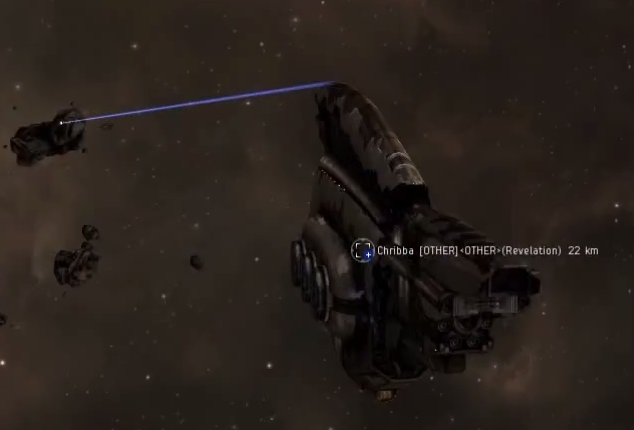 A viewer who isn't familiar with EVE could get a very positive impression about the game. An exciting gameplay in a dangerous, breathing universe. 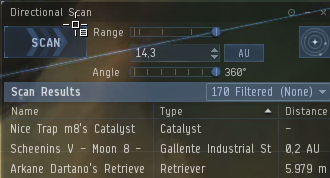 Yes, in Highsec. 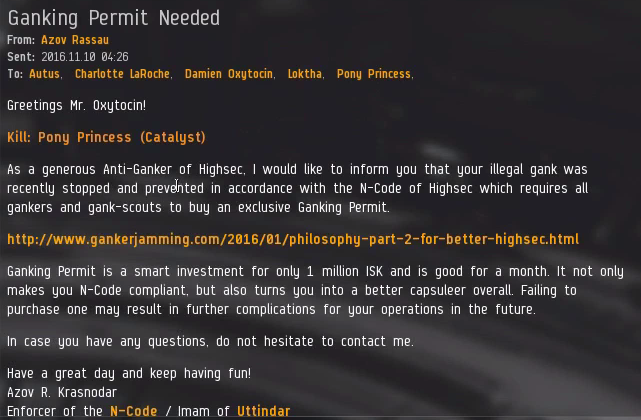 Of course, I sent a mail about the situation to the ganker, his scouts and a nearby Anti-ganker in the area. After all, I have my own Code to guide my actions. I also received kind EVE mails from the Hulk pilot as well as the Proteus pilot. Both of them kindly expressed their gratitude and shared some details from their side. This was indeed a happy moment for me. Anti-ganking is not a completely thankless task after all. Overall, it's quite remarkable to see the blatant difference between the two miner cases. 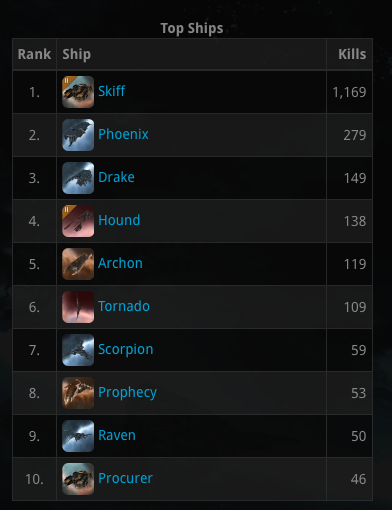 Obviously, there's a lot of work to be done in Highsec. 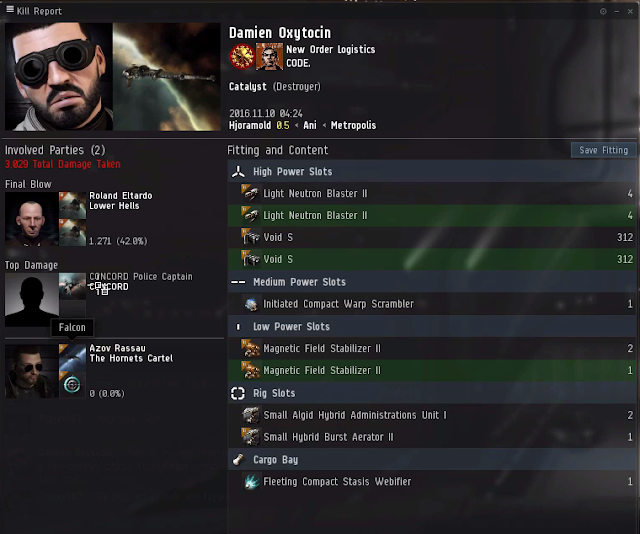 The heretic Damien needs to develop compliant fits and purchase a ganking permit whereas the angry TracerTK7 should realize that Highsec isn't 100% safe and should learn to avoid gankers or fight back. The wisdom of the Neo-Code will guide them, but I still wanted to contact this miner to give him some advices, which is another way of enforcing the N-Code. I haven't received a reply yet. Maybe he's AFK, or maybe he's trying to reply while being AFK by using some supernatural wireless replying method used in AFKland, which doesn't work and exist. By the way, Damien hasn't bought a permit yet. A day later (today), Damien's operation was jammed again, this time by Alister Rosenheim's Falcon. However, superstar Damien and "Pony Princess" were actually YOLOing onto a Skiff, knowing that they can't gank it, but jamming is a means of communication, so that's OK.
To all angry miners out there: Be a doer, not a talker. Stay classy, fight back! 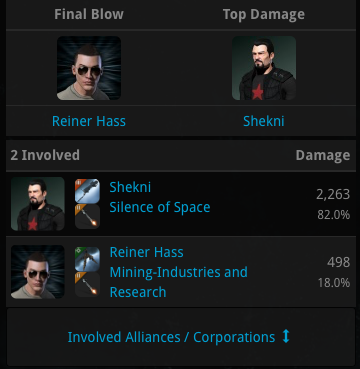 The ongoing victory of the ECM Skiff is bringing more refreshment, fun and justice to Verge Vendor region of Highsec. The ECM Skiff has the Neo-Code and GankerJamming to guide its actions, which is why it ALWAYS wins. 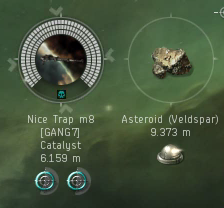 The latest gank-prevention happened in Scheenins against the aptly-named Nice Trap m8, a recently born ganker with already many successful punishments against stupid AFK miners. Nice Trap m8 had every reason to be happy: his own corporation, a hilarious YouTube channel and an emergent ganking career. There was a problem though: he did not have a ganking permit. So I went to Scheenins and looked for attractive gank targets that I can protect. There was a Retriever at one of the asteroid belts. For the next 20-30 minutes, I waited for a sign of the ganker. 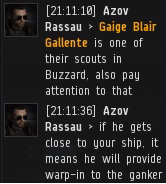 Shortly after the ganker's arrival to Local, his scout Gaige Blair Gallente ran a quick scan with combat probes of his Buzzard. The robot-like heretic in the Catalyst was now on his way towards our guidance, justice and emergent enlightenment. As soon as the Catalyst landed, the Skiff's third officer Khaled ben Abdelaziz Al-Winchestori locked the target and second engineer Abdourahman Ibn-Weaselior Adoudel activated the strong emission of ionized particles towards the heretic. Another beautiful screenshot: Triangle of Content! Another victory for the ECM Skiff. The gank was stopped successfully. As always, CONCORD was pretty much useless and late to the party. Seriously, who needs CONCORD when there is emergent & fun player interaction like this? 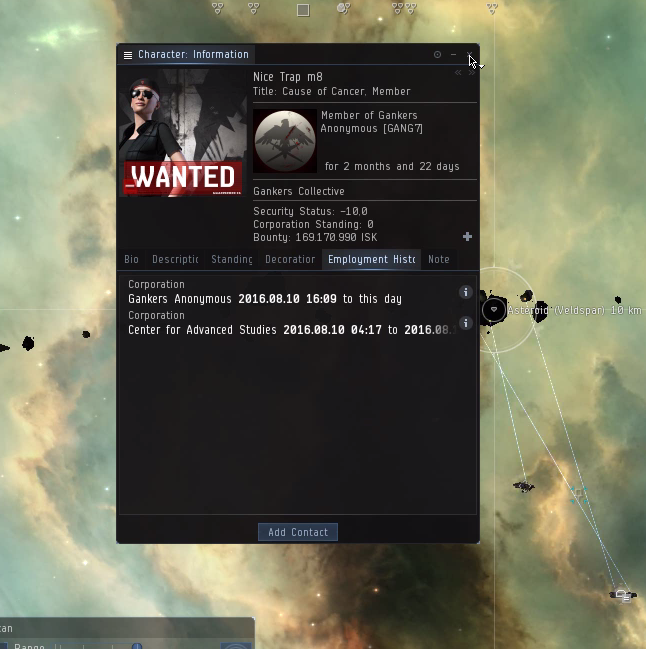 Believe me, the day CCP nerfs NPC police and actually gives some more opportunities and rewards to real player interaction, it will be one small step for CCP and one giant leap for Highsec. As can be seen in this example, motivated and dedicated players can catch the outlaw gankers (-5 and below) at gates. This prevents the ganker from even reaching his target. In this example, the DPS was done by real players before the NPC Faction Police had even arrived to the scene. 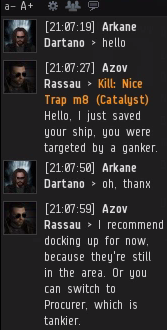 Anyways, unlike many other gankers, Nice Trap m8 was surprisingly silent after his ruined gank. No compliments, no 'gf', no tears. Was he mad? Or is this another hopeless case of force tranquille like the notorious ganker Keikira Otsada? Over the course of years, we have seen gankers with interesting names: fascinating philosophies like Gaylord Fappington, microeconomic trends like Currin Trading, exotic inspirations like Salah Ad-Din Al-Jawahiri or breaking news like JerryRin AT2016 Commentator. However, few gankers have reached a high level of accuracy in their names. Nice Trap m8 is one of them. gf m8! He wasn't AFK, which is great. The first advice is to fly tanky. 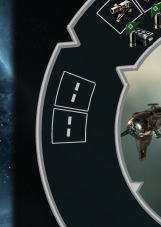 This means Procurer or Skiff. Also, he could just dock up or go elsewhere to do something else. 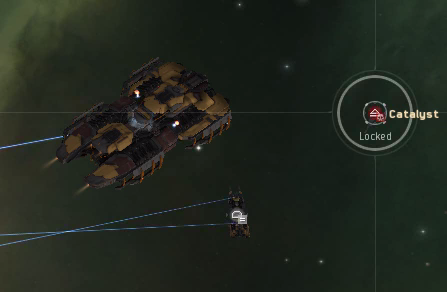 Surely there are other things than mining in EVE. The second advice is more about situation awareness. Known gankers should appear in Local at all times. That is a useful early warning. The miner was thankful. See? 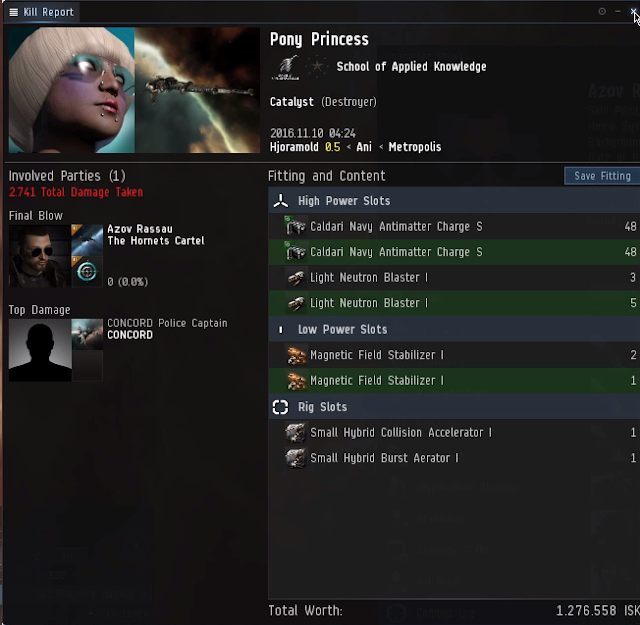 Not all highsec miners are angry AFK carebears. 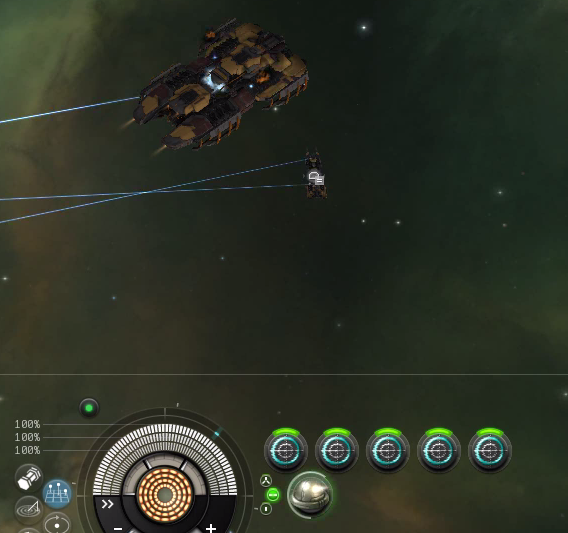 The third advice is about knowing how miner ganking is organized. 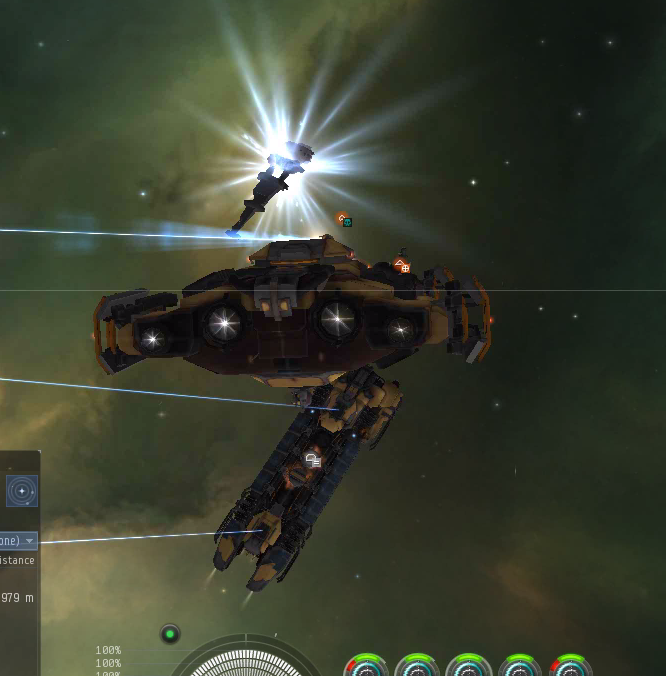 Scouts providing warp-ins by Approaching the target is quite popular, but in this case, the scout used Combat Scanner Probes to find the target. It is therefore also important to keep an eye on D-Scan and look for possible combat probe spikes within close range of your ship. 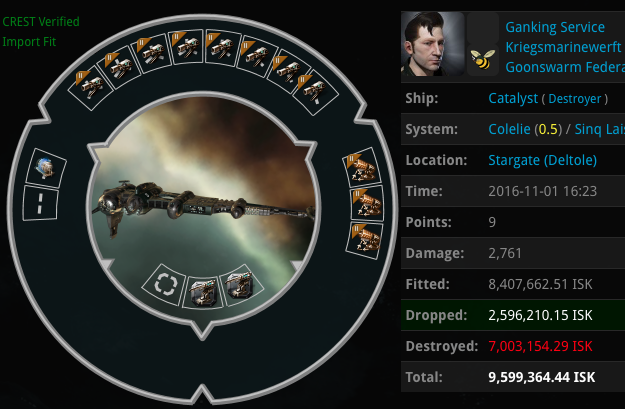 D-Scan, D-Scan, D-Scan. It has been said a million times on blogs and forums. Use it, embrace it. If they show Catalysts, get ready to warp away. It is now up to the miner to pay attention to his surroundings and mine like a boss (obey the Neo-Code). If he fails to do so, he will simply put his assets at risk. 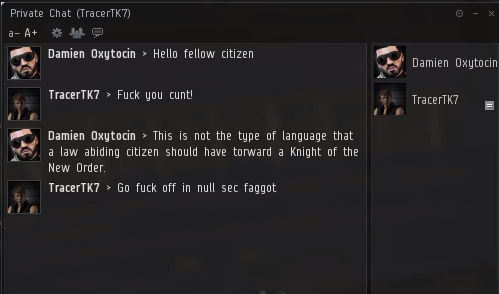 While our ECM Skiff is a dazzling and victorious figure of Highsec Anti-Ganking, there are also people out there who enforce Skiffology in different areas and ways. Allow me to introduce you wanon. Slow clap and a beer to you sir.